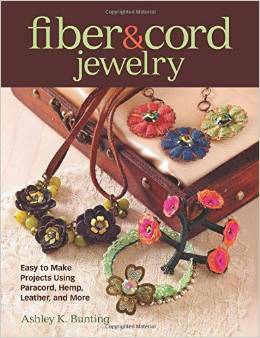 Did you read my review of Ashley K Bunting's Fiber & Cord Jewelry? Did it catch your attention? Do you want a copy...? I absolutely love Ashley Bunting's style and would love to win her book! I have never tried this type of jewelry before and I would love to win this so I could thanks for the chance to win this! I would love the chance to win this book! Wow I'd love to win this book, these projects look fantastic. Thanks for the chance! This looks like an amazing book!!! I haven't used stringing materials like leather and hemp before. This book would be a great resource to try them out. Thank you for the giveaway. Thanks again for your giveaway.